I recently finished an 11 month assignment working for the South East Rivers Trust, an environmental charity dedicated to conserving and restoring rivers. Rivers trusts are national and have been described as having “wet feet” concentrating much of their effort on practical catchment, river and fishery improvement works on the ground. So I was delighted when at the River Restoration Annual Conference in 2015, I was approached by the Director of the South East Rivers Trust, Dr Bella Davies, and asked if I could work for them on a secondment to work on some government-funded projects achieving Water Framework Directive benefits. I was thrown in at the deep end (only knee high really) and in my first week I was in the River Teise, a tributary of the Medway in Kent, removing wooden boards from Harpers Weir. This was physically tiring work because we did it by hand, using saws, crow bars and brute force. The plan was to fully remove the concrete weir to enable fish to freely move up and down the river and improve conditions for plants and wildlife. Manmade structures, such as weirs prevent rivers from behaving naturally, whereas fish, wildlife and plants thrive in rivers which have a variety of fast flowing and slow flowing sections which create a meandering river channel and features such as riffles (areas of shallow fast flowing water where fish lay their eggs) and pools (where fish can rest and breed). 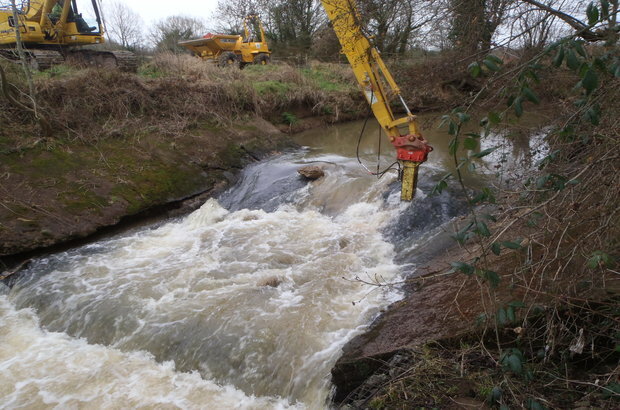 In February we carried out the full weir removal. We used a company who had done this type of work before and had the right equipment. The concrete weir was broken up using a ‘breaker attachment’ – a large drill attachment which hammers the concrete to break it up - and it was removed from the river. This was done over 4 days and the river settled down amazingly. A week after the removal, I counted 13 riffles in the 700 metres upstream of the weir - one of which was 20m long. This has had a huge improvement, fish can now move freely up and down the river, reaching the entire valuable new habitat which has become uncovered since removing the weir. At the start of the project in the River Teise, there were no riffles so it is now fantastic to see the benefits. Spending every month of the year from September to March in a river. I really did get wet feet! 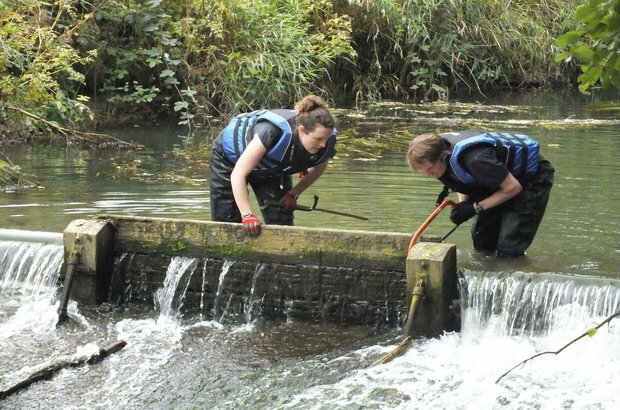 Supporting the South East Rivers Trust in successfully applying for the Environment Agency’s fisheries improvement fund which meant a weir removal project could be extended in a habitat and fisheries enhancement project involving different organisations and volunteers. Presenting a poster on Harpers Weir Removal and creating ‘Rosie's Riffles’ at the Annual River Restoration Conference. Looking at removing and enhancing fish passage at Sessingham Weir on the Cuckmere in Sussex. This has been a fantastic learning experience for myself and both organisations with great results for the environment. This article previously appeared on the Countryfile blog. Nothing to be proud of. Weirs play a vital role in many rivers helping control excess flood water and regulate that excess flow thus protecting the environment below. You may see new riffles soon after but wait until a heavy flood goes through, they will soon dissapate. Weirs help create better environments for fish and wildlife and protect bankside habitat. Think again if you believe removal is beneficial.